This week I saw a teen who has become a vegetarian for ethical reasons which is a decision I applaud. On a nutritional level however if you do want to cut out meat its critical to make sure that you do include the right sort of vegetarian proteins in your diet as well as lots of vegetables. The worst vegetarians I see in clinic are usually the ones who don’t like vegetables – chips and tomato sauce or toasted cheese sandwiches are not adequate sources of nutrition!! So how do you become a good vegetarian? First off lets assume that you love your veggies or if not you had better learn to love them as its going to comprise the bulk of your diet – ideally at least 3 to 4 cups of vegetables a day. Then we need to add some protein sources, eggs, cheese, tofu and legumes are all good options. The egg is in fact the perfect source of protein against which all others are measured. Cheese and dairy foods are great if you can tolerate them, as many adults become lactose intolerant as they age and lactase levels decline. In which case yoghurt may be a better option as the fermentation breaks down the lactose. Next its really about seeking inspiration from cultures that have a wide range of vegetarian foods – Indian curries are a great source of variety and flavour. One of my favourite simple curries – potato, pea and cauliflower I found one day as I was googling recipes with only three ingredients to cook at Taste and its now a firm favourite. Another version of a simple potato curry I found in Stephanie Alexander’s cookbook and then modified to reduce the number of ingredients – if you like it spicy double the curry paste!. Add a little oil to the pan and a chopped onion plus the spices. Fry the onion in the spices. Add two potatoes, a quarter pumpkin, two red capsicum (scrub potatoes, don’t peel – less work and better for you). Cut all the vegetables about the same size – for instance, in quarters. Chop and slice salted eggplant and two zucchini. (Before you use eggplant – slice it, pour salt on it and then after 10 minutes scrape it off). Cut into cubes and then stir this through, add a can of chopped tomatoes, cover for 20 minutes, cook on low heat. Check that the potatoes are getting soft. Add a small can of coconut milk and simmer for a further 5 mins before serving. Variations: add a bunch of spinach (chopped) or Chinese cabbage a few minutes before its finished cooking.Leftovers will make another meal with a tin of legumes or chickpeas added for some variety. Whilst many people think of humuus as a good option to add to a vegetarian meal realistically most beans lend themselves to being cooked, pureed and flavoured with lemon, garlic and herbs. Try a cannellini bean dip for example. Another option with vegetarian food is to look at Mexican recipes for inspiration – a recent addition to my repetoire was Mexican rice and beans. Basically saute an onion in olive oil , add 1 cup of rice to the brown and warm it through and then add a can of black beans , a crushed clove of garlic and two cups of stock. Cook through and serve. Makes a good filling for tacos or fajita’s, specially if you add some guacamole for a source of good fats and a flavour some topping! Risotto with some type of legume like pea or mushroom also can create easy options. think about asparagus and pea risotto for example or spring vegetables. Use leeks rather than onions as your base to create a creamier taste. Soups and noodle dishes can also add variety and inspiration – think about Malaysian laska with tofu for example or pad thai noodles. Still struggling to find options? Christine Pope is an experienced nutritionist and can help you create nutritious vegetarian or other menu’s. Appointments are available on Tuesday or Wednesday on 8084 0081. 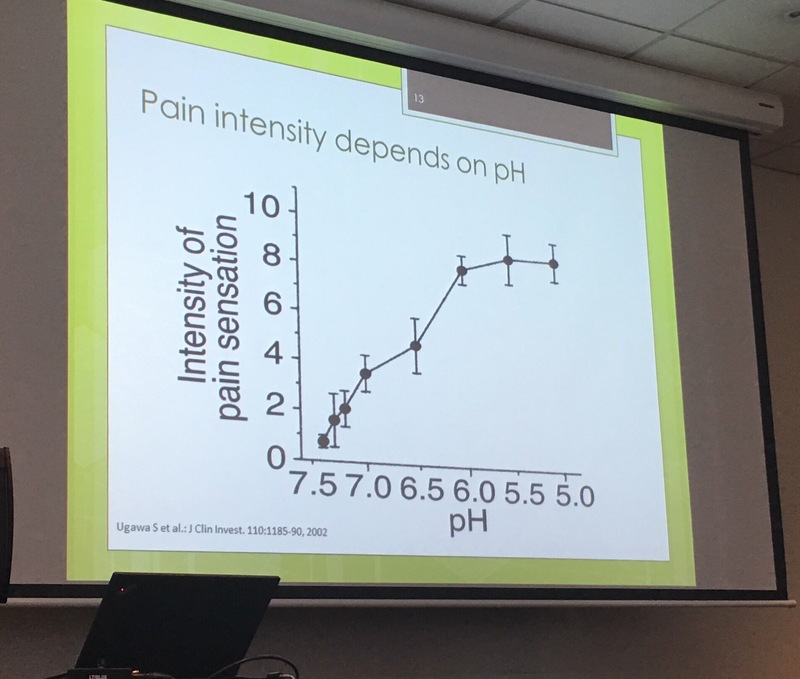 People who are acidic experience more intense pain. Basically receptors are able to absorb more signals in an acidic environment thereby intensifying the experience. Each tissue requires a different type of Ph to do its job correctly however blood operates at a very narrow range and will pull calcium from bone to form calcium carbonate and alkalise. Acidity therefore aggravates conditions such as osteoporosis where bone density is already low. The body can excrete acidity but only about 60% of what most people produce. The major factor in whether you are alkaline or acidic is your diet! Well the standard Australian diet also known as SAD creates more acidity than we can excrete. Typically foods such as grains are mildly acidic, meats are more acidic and vegetables are alkaline. A diet heavy in meat and grains is more acidic. For more information on the acidity and alkalinity of foods have a look at Acid base nutrition . How do you compensate for a diet heavy in grains and protein – well if you are eating the SAD you need 12 serves of vegetables a day! That’s the equivilant of 6 cups of vegetables which is an awful lot for most people to eat. Alkalising your diet can be as simple as having modest serves of protein (palm sized and thickness) plus 3 serves of vegetables with each serve. A moderate amount of grains possibly 2 serves a day plus good fats. Fats are neutral in this equation. In other words a healthy balanced Mediterranean style diet. No demonising one component like protein or fat just a diet loaded with vegetables, proteins, carbs and fat!! Christine Pope is a practicing nutritionist and homeopath based at Elemental Health, St Ives. Phone for appointments on 80840081 or book online at Elemental Health . Last weekend I was at a conference where the topic was Innovation. It was an interesting area to consider as a Director and even more challenging was its application. How do you encourage and develop innovative thinking in your organisation? It’s an even bigger challenge for most of the attendees as the organisations were largely associations and Not for Profit’s who usually aren’t well funded and often run by volunteers. So what were some of the suggestions and how could this be applied in the healthcare space ? Often with packed agenda’s in a meeting its hard to find time to solve problems creatively. Allowing time on every agenda to brainstorm a problem allows for discussion of other options and possibly new insights. It also creates an environment where people don’t feel they have to stick to the status quo – the dreaded “that’s the way we have always done it”!! Not everyone is happy to provide input quickly and succinctly in a meeting. Asking everyone around a table to express a viewpoint on a subject provides a forum to open up the discussion. Ideally don’t just start with the same person but mix it up. Be open to having meetings in different locations or even bringing in external parties to present different views. The energy of meeting in a coffee bar can be a lot livelier than a set meeting room. Even changing rooms on a regular basis can be a good protocol just make sure everyone has enough space to be comfortable and can move around. So how can we apply this in healthcare? Specifically how could I apply this in my practice? Staying current with new developments is really critical and one of the reasons I am constantly looking at seminars or workshops. How can I get people better faster? For example I had always found treating Candida with a diet and specific homeopathics quite difficult and slow. Anti-candida diets are basically no wheat, no dairy, no yeast and no fun! On the basis of a recommendation at a workshop I tried using a berberiene based herbal product and found my results were significantly quicker and much easier for clients to maintain. My strategy is to look for the innovators and pick the eyes out of their treatment protocols. In terms of meeting differently I would occasionally run workshops and I really enjoy the energy of working with a group and the networking that often results. This is now on my agenda with a permanent focus on education around existing programs but also continuing some of my successful workshops. Using this format is also a good way to keep costs down. A 2 hour workshop at $49 is a great addition to a treatment program and also keeps costs down and makes healthcare more affordable. Maybe another alternative is to start recording the sessions and make them available to clients as an easier way to work with me. The reality of innovation is much more difficult to grasp than the concept. Often in practice I see clients who are stuck in a situation and think they have no options. As soon as you start to see stress levels come down its amazing how possibilities open up. For practitioners I think its a question of staying current and adopting strategies that work well for them and how they practice. Christine Pope is based at Elemental Health at St Ives and is available for consultations on Tuesdays and Wednesdays. Appointments can be made online (very innovative!!) at http://www.elementalhealth.net.au or by calling 02 8084 0081. 6 common medications that are robbing you of nutrients. Do you need to worry about the effect of medications on your intake of vitamins and minerals from your food? More than likely its worth having the conversation to see if there are any particular concerns that need to be addressed. You may be able to do it via your diet but often the dosage required is easier to get through supplementation. What do you need to think about when you are on medications in regards to managing side effects? I have compiled a list below of common medications and some suggested nutrients to manage the side effects, however rather than taking everything on the list its always preferable to work with a practitioner to ensure that any interactions are monitored and that you have a workable program. Statins. A common problem is for people on statins (cholesterol lowering medication) that they start feeling less energetic as the statins deplete the levels of Co Q 10. CoQ10 is important for energy production within the cell. Supplementing an appropriate level of CoQ10 can make a big difference for these people. The Oral Contraceptive Pill is known for reducing levels of B6 an important B vitamin for hormonal health. Support at around 50mg a day of B6 is usually best sought in the form of a multi-vitamin with a range of B’s. Metformin which is often given for Diabetes can reduce levels of both B6 and B12. Low B12 may lead to peripheral neuropathy which can cause loss of sensation in the feet or tingling or burning sensations. Again a Multi vitamin with adequate B12 is essential . Anti-depressants need B vitamins for optimal effect and whilst they may not reduce levels specifically they may be less effective if you are not taking a multi vitamin at the same time. Antibiotics Antibiotics can disrupt the natural bacteria flora in the digestive system, killing beneficial bacteria, including Lactobacillus acidophilus and Bifidobacterium bifidum . Use a good quality brand such as Inner Health with at least 1 billion live organisms for effective management. Hormone Replacement Therapy impacts on folic acid (B9), B6 and B12 as well as magnesium levels. Natural medicine can be a great option to help manage side effects as well as providing options to drugs when side effects are not well tolerated. Christine Pope is an experienced nutritionist and homeopath based at Elemental Health , St Ives and is available on 8084 0081 for appointments. There are a lot of people who need to change their diet and go gluten free. Whilst approximately 1% of the population need to go gluten free as a consequence of coeliac disease another 6-8% of the population suffer from non-coeliac gluten sensitivity. Many people who suffer from other auto-immune conditions also find that removing gluten from the diet assists in managing their condition. You realise that you need to make this change but you don’t really know where to start? This blog will help you get started with those changes. 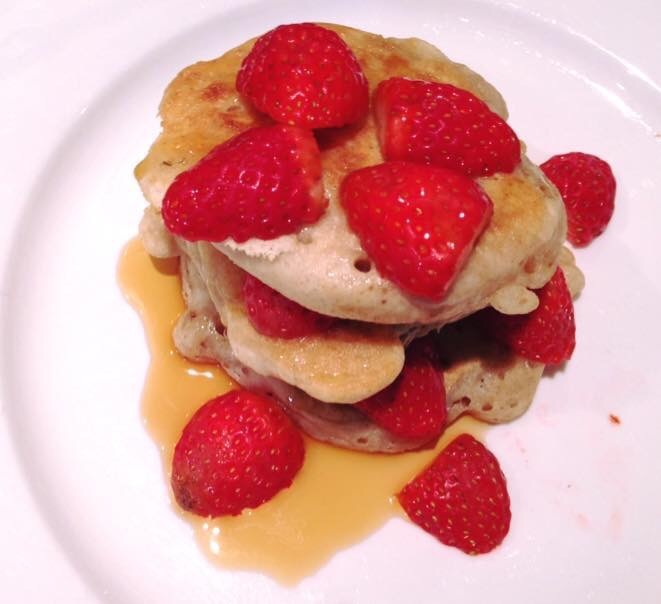 Lots of recipe ideas are contained in my page Gluten and Dairy Free Dinners and the recent blog Seven gluten and dairy free breakfasts. The best way to start a gluten free diet is to do it after restocking your pantry and freezer. Look at what you usually eat and then prepare a shopping list to enable you to stock up on alternatives. Replace bread and crackers with suitable gluten free alternatives. Suitable alternatives for bread could include gluten free bread from Country Life, Dovedale, Healthybake, Schars or gluten free bakeries. Choices Bakery at Turramurra has a wide range and Deeks Bakery in Canberra provides online ordering across Australia. Gluten free bread is best served toasted and should be stored in the freezer so you can use it as needed. There is already a good range of gluten free crackers including rice crackers and corn cakes available in most supermarkets. Just read labels to make sure that there are no other ingredients that are problematic particularly if you have multiple food intolerances. Breakfast cereals often include gluten so its important to ensure that you have a suitable alternative. Commercial rice bubbles and cornflakes for example can contain gluten so its best to find alternatives such as puffed rice. Making your own muesli is an easy and cost effective option using a range of gluten free puffs and flakes as well as dried fruit, nuts and seeds. 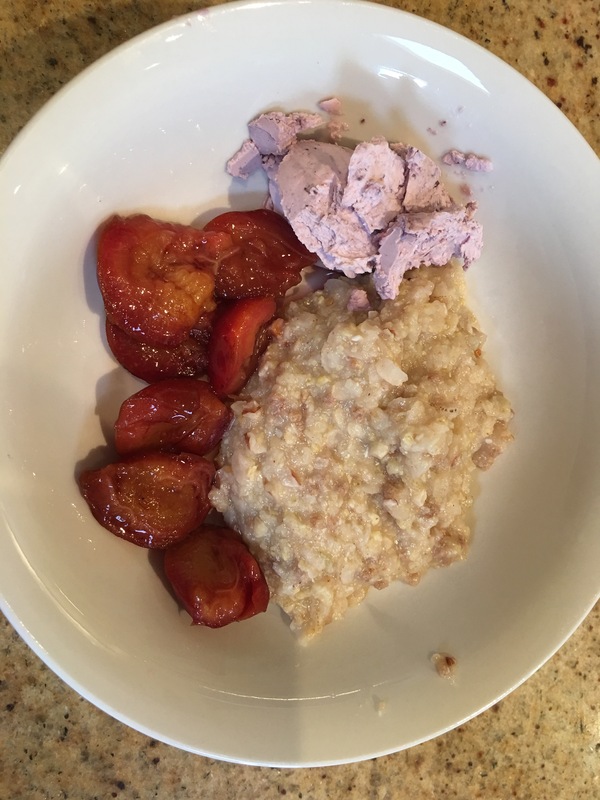 The porridge below is from Brookvale farms and is served with stewed plums and coconut yoghurt. Its tasty and only takes a few minutes to prepare. Pasta might be a good option for quick meals and there are several gluten free pastas to choose from including Orgran who have an excellent lasagne as well as San Remo. Ideally when cooking gluten free pasta keep stirring it whilst cooking to stop it sticking together. Also make sure that you rinse it well before serving. Baking is easier with gluten free options at hand such as gluten free plain and self raising flour plus gluten free cornflour. These can often be substituted in baking however generally if you don’t have gluten free flour you are better off using a mix of different gluten free flours to really improve results. Stock up on a range of rice including basmati and risotto rice so that you have a few different alternatives for meals. Check the Celiac organisation website for lists of foods which may have some gluten. Often it can be surprising with things such as soy sauce and BBQ sauce containing gluten which doesn’t seem quite unnecessary. Do you have any other tips for going gluten free easily? Please post them in the comments section below. Need help deciding if you need to change your diet? Christine Pope is practicing at Elemental Health St Ives and can be contacted for appointments on 8084 0081. Are you fueling your brain for high performance? Do you find it difficult to study for an hour? Is it hard for you to concentrate? In many ways our brains are like computers – garbage in garbage out. A diet high in refined carbohydrates, such as bread and pastries, is not ideal for anyone who needs to concentrate. Many people know that the brain’s preferred fuel is glucose and it uses approximately 120g daily which is about 60% of the body’s glucose in its resting state. This energy is required to make neurotransmitters and also initiate nerve impulses (1). Without adequate fuel we can’t think or function effectively. On that basis if its optimal to have a constant stream of glucose entering our brain then don’t we need to be eating lots of refined carbohydrates? Well actually no because whilst these give you a short term bounce in the blood’s glucose levels they do not actually allow for a slower release which actually provides more effective fuel. Ideally what you want is either a slow release carbohydrate which tends to be found in whole foods plus a small quantity of protein. Protein is required to make most neurotransmitters in the body and it forms an ideal combination – we don’t require large amounts and respond better to small serves regularly. How do you know if your diet is slowing your brain? Common symptoms are things such as feeling hungry or tired within a couple of hours of eating, particularly getting sleepy two to 3 hours after lunch. 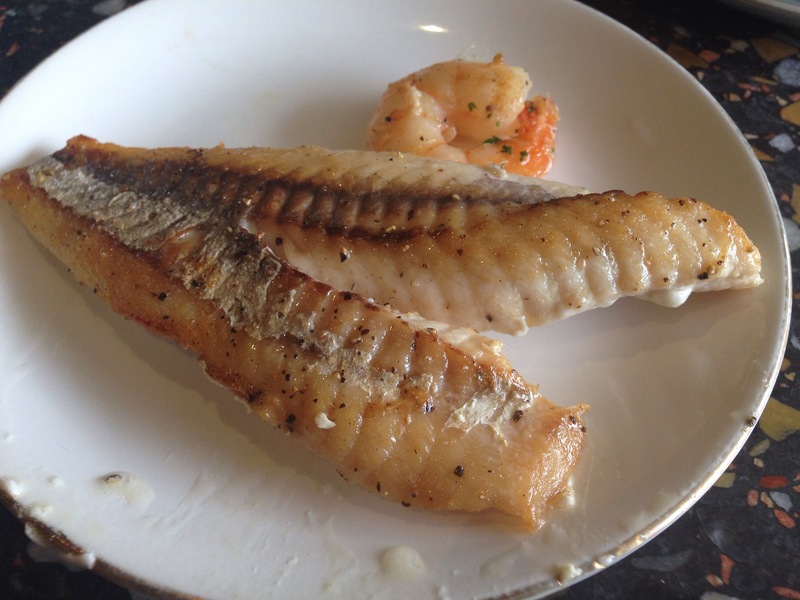 Another nutrient that is really important to brain health is DHA – an essential fatty acid found in oily fish . It is critical for brain development but also for the maintenance of the brain. Low levels of DHA contribute to learning difficulties. Good food sources are oily fish, eggs, nuts, seeds, organic meats as well as dark green leafy vegetables. Oat based muesli or porridge. If you can’t tolerate dairy then make the porridge with half a cup of frozen berries per serve added about 1 minute before its finished. Yoghurt and fruit with LSA mix or chopped nuts. Traditional fry up of bacon or sausage with vegetables. Green smoothie with spinach, strawberries, almond or coconut milk or water and a protein powder. As always nutritionally variety is ideal, so mix it up – have the smoothie when rushed and the omelette or fry up when you have a little more time. Try these changes for for two weeks and then see what a difference it makes to your study performance. Christine Pope is a nutritionist based at Elemental Health, St Ives and a director of ATMS. She can be contacted on 02 8084 0081 for appointments. 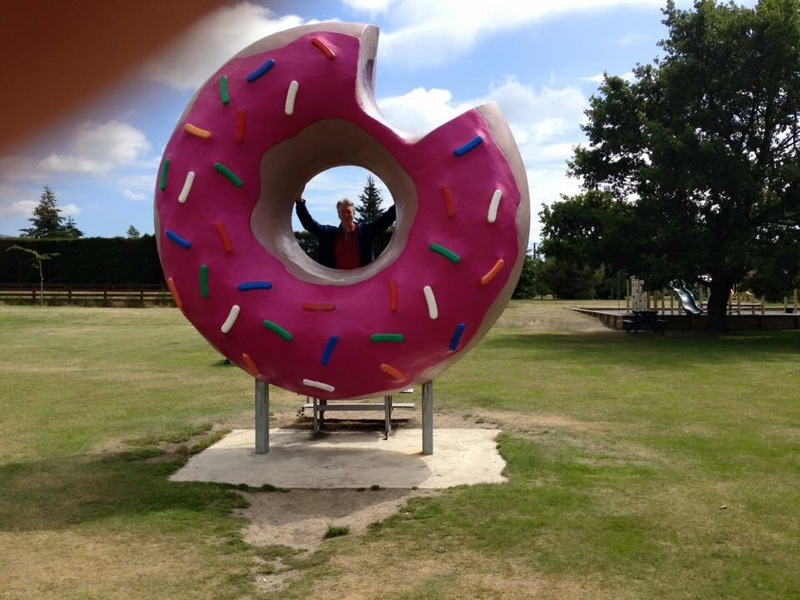 A trip to the South Island of NZ is a great short holiday but what impressed me on this trip was how well food intolerances were managed. It’s obviously easier with a common language to discuss menus but consistently I saw staff who were across the issues and could advise on alternatives. One of the good things around the Canterbury region of NZ was that menu’s were often marked gluten free (or dairy free or vegetarian). Even in fairly small towns with two or three cafes there was often at least one cafe with allergens marked. The first night we landed in Christchurch around 11pm so we were happy to eat breakfast in the hotel restaurant and I was thrilled to see a gluten free vegetarian slice on the menu. I ordered it with a side of bacon and it was very tasty. They also had a water urn with fresh citrus which was such a good idea when you are dehydrated after a flight. We stayed at the Commodore Hotel near the airport and I can highly recommend this option for travellers. From the shuttle driver who picked us up late at night with a string of helpful instructions to the staff on the front desk who basically insisted on driving us to the car rental the next day and the restaurant staff who went out of their way to organise tea for me at midnight. It was a well run hotel with a great team! The next day we travelled via a little town called Springfield to Arthur’s Pass where we had booked in at a wilderness lodge for New Year. Trip Advisor had flagged a gluten free cafe there but it had shut for the holidays which was disappointing. The Yello Shack cafe, which sat next to Springfield’s major attraction (a big donut) did offer a range of gluten free treats, including a gluten free caramel slice that was almost as good as my brother’s. The lodge at Arthur’s Pass was a bit of a treat for our anniversary and provided all our meals for a few days. They catered well to allergens for entree’s and mains but were not quite as comprehensive on desserts. They also had a nice gluten free sourdough the first night with olive oil which I really appreciated. The packed lunch with sandwhiches made with a seeded Vogel loaf were also excellent. My favourite entree was a Salmon and Potato Fish Cakes which was made with mashed potato and was fresh and flavourful. We also enjoyed fresh venison and other local specialities. Must remember to send them some gluten free muesli slice , quinoa choc chip cookie recipes and a few dessert options to round out their offerings. 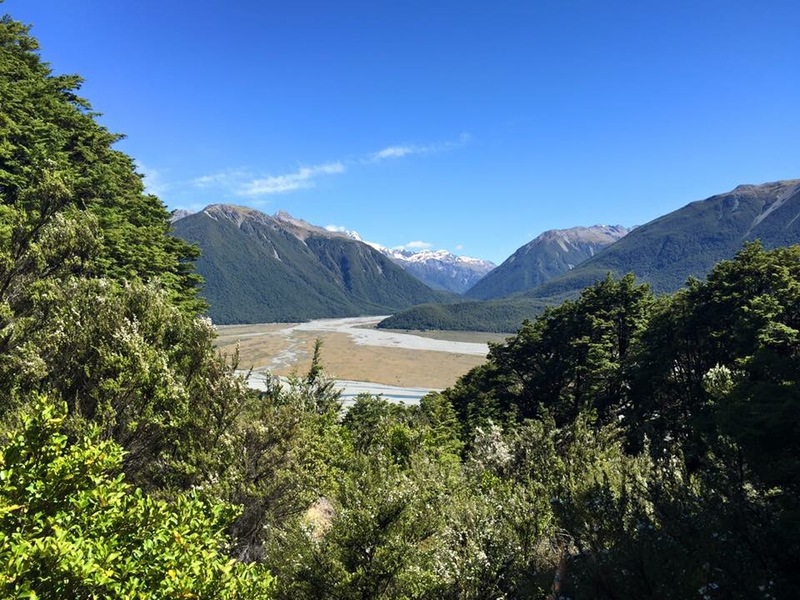 From Arthur’s Pass Wilderness Lodge which had included guided walks we repaired to Hanmer Springs to soak our tired limbs. On the drive we stopped at the Red Post Cafe in Culverden which had a sign up inviting you to ask about their gluten free options. We both enjoyed a Smoked Chicken salad with a cranberry style dressing, sweet but tasty. Hanmer Springs is a popular tourist spot with lots of dining options including our hotel which had quite a formal restaurant. The Braemar Lodge was a recommendation from my youngest sister from her last trip to NZ and its a luxurious spot if you want to indulge. 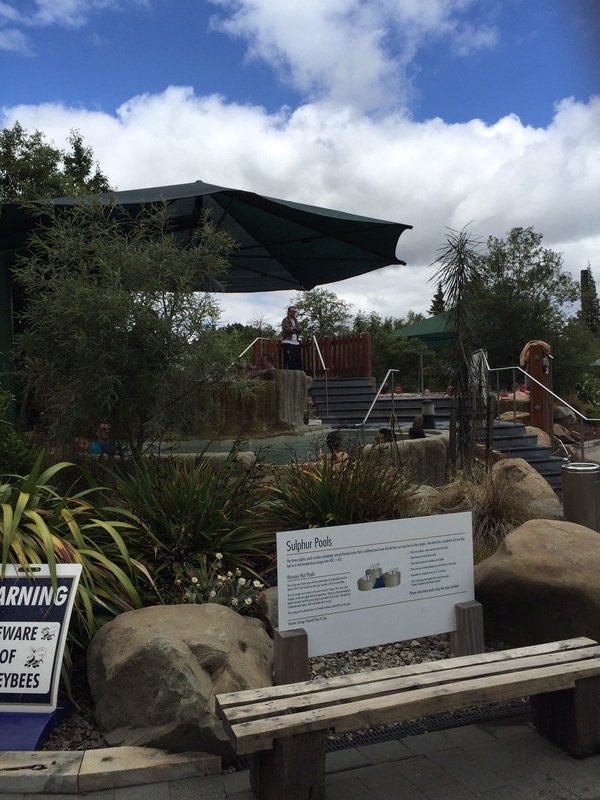 They have very large rooms, spas on the balcony’s and their own Beauty Spa, which was largely priced better than the one at Hanmer Springs Thermal Pools. The only downside is its about 3km of dirt road to get there and it really isn’t easy walking distance to the Springs. The standout meal for us whilst we were there was at Malabar, which is advertised as Asian Fusion. The menu was clearly marked with gluten and dairy free options and when queried staff could easily explain when a dish wasn’t marked gluten free. We started with onion and spinach bhaji which was in a chickpea batter and followed it with caramelised pork belly (gluten containing ingredient was soy sauce) and wok fried fish with some poppadoms. It was all delicious and we would happily have eaten there again. There were a lot of other options for gluten free dining in Hanmer Springs with options such as salads, nachos and the option of gluten free bread for sandwhiches and our hotel also provided gluten free cookies and gluten free bread at meals which were really appreciated. The major surprise for me was that when I walked into the cafe at the thermal springs they had quite a range of gluten and dairy free items, including a delicious ginger slice which went very well with my cup of green tea. 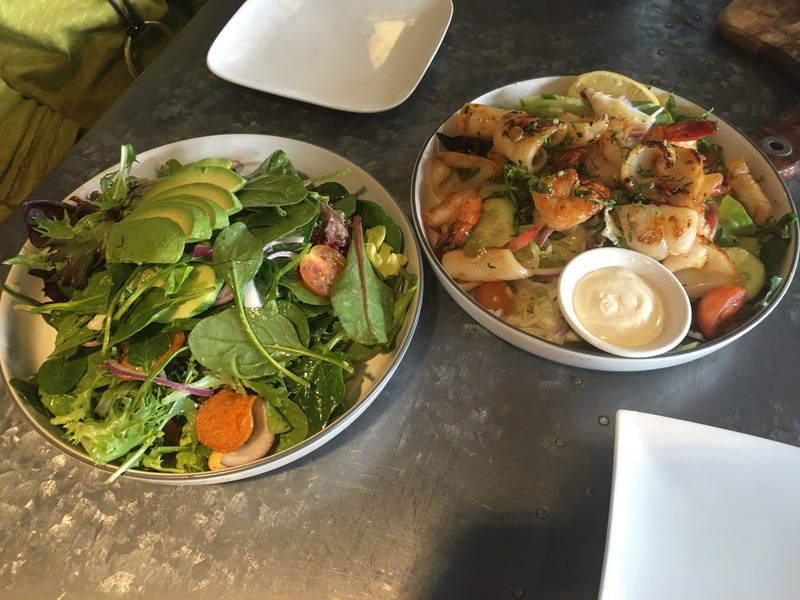 A day trip to Akaroa, which is a lovely little French town about 100km’s from Christchurch brought us to the Trading Room restaurant with a very reasonably priced seafood platter served with gluten free bread and salad. It included generous quantities of prawns, calamari, two types of fish and the local specialty Green Lipped mussels. We did a little bit of shopping for picnics and generally found the best gluten free options in the New World Supermarkets. We did try Pak n Save once but never again!! My advice to people travelling in this region is to do a little bit of research on gluten free options online before you travel however Trip Advisor turned out to be the most useful app giving reviews for local restaurants and I was glad that I taken up Vodafone on their $5 a day NZ plan to access my usual data as Trip Advisor and Google Maps really made the trip a lot easier.